Tomorrow, I begin working with the schools in Webster Parish. I’ll be teaching a unit there on creative writing and the literature of China. Should be quite fun. However, the pressure and the logistics I’ve got to sort out today caused me to wake early (It’s what you call insomnia, I guess). I’ll likely take my guitar also. I own two guitars–one an old American-made Guild, and the other a Takamine. 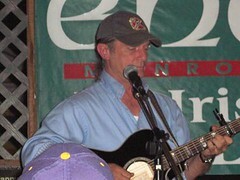 Below is a picture of a performance of mine at Enoch’s, the only Irish pub in Monroe.